birds : I visited the Fan-tailed Warblers today, thinking that they surely by now they have some fledged youngsters. But no, the female was still bringing food to the nest site so there must still be chicks in the nest. At least I was able to find the (almost) exact location of the nest in the scrub. I sat in amongst the Fennel nearby and, although I wasn't really, really close to the nest, the female wasn't daft and refused to take the juicy spider it had caught back to the babies. Just shows that you don't have to be disturbing the actual nest to be disturbing the nesting process. So, of course I quickly retreated. Also, it seemed like the male's job was not finding food itself, but trying to distract attention away from the nest site whenever the female returned with food. When I heard the male calling loudly and flying round, often the female would fly in low with food. I don't know whether the species actually does this but that was my impression. An hour and a half seawatch yesterday in poor visibility produced just 2 Balearic and 2 Manx Shearwaters but my highlight was a tight flock of 55 Common Terns that raced through close offshore. moths : Whilst sat on a rock waiting for the Fan-taileds to show, I noticed a tiny moth scurrying along the rock next to me. It was the distinctive micro, Eulamprotes wilkella. This is a very rare species on Guernsey and this was only the second modern sighting (it also lives on Herm Common) and it lives on sand dune systems associated with Thyme. Way back in 1875, the famous Lepidopterist W. A. Luff, recorded this species at "The Grandes Rocques", which may have been the same location as I saw it in today. It is nice to think that a species can persist at a location for 134 years without being noticed in all that time. A Gypsy Moth was in the trap this morning - always a quality migrant - but it has been a bit cold and damp this week to get good catches. I have made a slight change to the trap by sticking some mirror tiles to a piece of plastic, resting at 45 degrees so the UV radiation will bounce straight up to the sky rather than being wasted going straight into the wall. Hopefully it will improve the catch but its impossible to be sure. nonsense : Rosie and I have been married now for 11 years and i can honestly say that it has been a great privilege for her. Imagine 11 years being regaled by tales of vagrant phylloscopus, and explanations on the merits of the attacking full-back, and the endless BUBO birding anecdotes, and the intricacies of tortrix identification, and the excitement of adding to my Pulias Pond list and the . . . . etc . . etc . . ad infinitum. 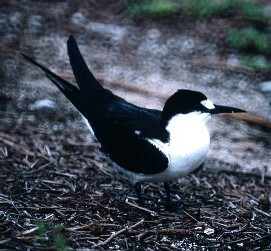 My first tick as a married man - Sooty Tern, Bird Island, Seychelles.